This clever device allows you to use cement to permanently post your picnic table frame into the ground. The top has the ability to receive a clamp that is placed over the leg of the portable picnic table leg or bench leg that is 2 3/8 inch OD. Use this inground post to make your picnic table resistant to vandalism. 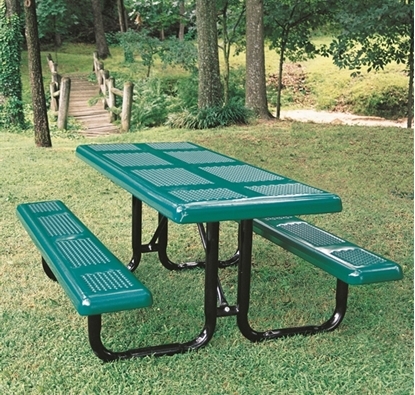 Rectangular 8 foot Thermoplastic Steel Picnic Table, Ultra Leisure Style, Seats 8 Adults, 226 lbs. 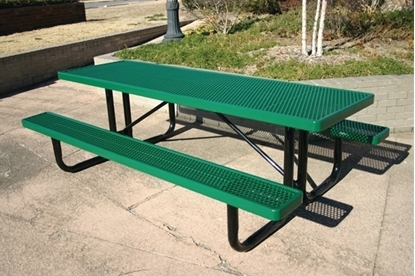 Rectangular 6' Thermoplastic Steel Picnic Table, Perforated Style Seats 6 adults, 235 lbs. 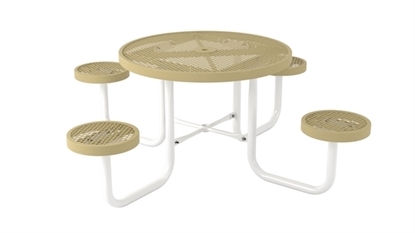 Round Picnic Table 42" Attached Round Seats Plastic Coated Expanded Metal with Welded 2" Galvanized Steel, Portable, 170 lbs.